Steelhead anglers on the tributary rivers and stream of the Great Lakes have been fishing with floats for a number of years. It's kind of like fishing for bluegill with a bobber and bait, but the current can be a lot swifter, the fish a lot bigger and the anglers a little older (at least chronologically). These rods are long for good reason. You need to be able to mend your line so you can maintain a drag-free drift and cover as much water as you can, plus when you lift the tip to set the hook, you can move a lot of line which is especially important when the floats are set deep or you're at the end of a long, extended drift. The extra length also helps protect lighter line, especially considering the size of the fish. The advantage you'll experience with the G.Loomis float rods is both technical and aesthetic. The rods are beautifully, hand-crafted with Fuji guides, Fuji reel seats and lightweight cork grips. There are three different handle configurations based on the length of the rod and the desired weight.... the 'Skamania' handle for spin reel or single-action reels and the Northwest configuration with extra-long rear grips for added leverage and fish-fighting control. We use our proprietary 'fiber blend technology' to reduce weight and apply specific characteristics for each section of the rods for strength as well as balance and sensitivity. It's a fun and effective way to catch one of world's great game-fish!! This is a float rod designed to fish small to mid-sized rivers where shoreline cover is an issue or it has a lot of twists and turns where you don't necessarily need to extend your drifts very far. It will handle larger water and big fish when necessary, but for the most part, it's designed to fish smaller rivers in close quarters. This float rod is designed to fish really clear rivers or low-water situations where you need to downsize both the baits and the line size to be effective. Smaller floats are implemented to keep from spooking fish and many times, rather than using bait, just a yarn fly or yarn fly combined with a small corky or other bait imitator will be used. Even though it is considered light power, it can handle surprisingly large steelhead. A great rod when the bite gets really tough due to overfished water. This rod is designed to fish medium to large rivers where you water conditions allow you to fish mid-range line, jigs & bait rigs as well as medium-sized floats. It will handle large steelhead and the smaller salmon species. A great rod when the bite is on and the fish are fresh. Our ”fiber blend technology” allows us to disperse the weight by using different fibers where their characteristics most benefit the rod for balance, flex and overall weight. 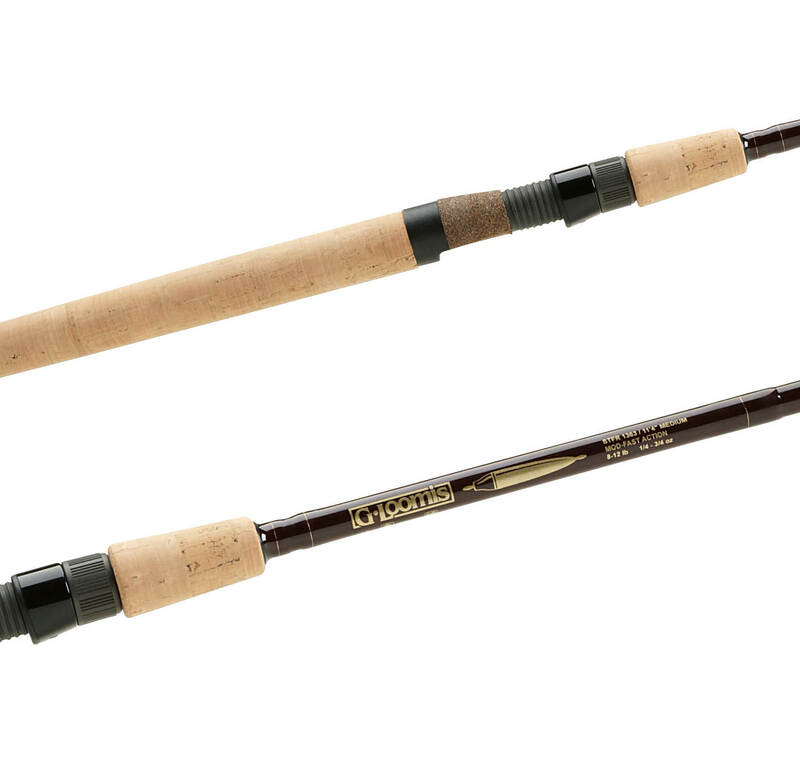 A powerful all-purpose float rod for large rivers and big steelhead. Designed for winter drift fishing, but it will work equally well for summer-runs and the smaller salmon species. The extra length gives you excellent line and float control to allow extra long drifts. It's your best choice for deep, technical water where slower, line-dragging soft water doesn't allow your float & rig to drift naturally because of the different currents. Designed for big, clear rivers where you need to downsize your line, float and rigs to catch those spooky steelhead, but you still need to cover a lot of water. It gives you uncanny ability to adjust your drift and reposition the float with minimal effort and will protect really light line. You'll be surprised when you see just how fast this long, soft rod will whip a fish. It's a lot of fun and extremely effective. The ”SK” signifies our Skamania-style handle. The fore grip is long to help balance the rod and keep your hands in a positive position to react quickly. This is the more traditional concept in float fishing.